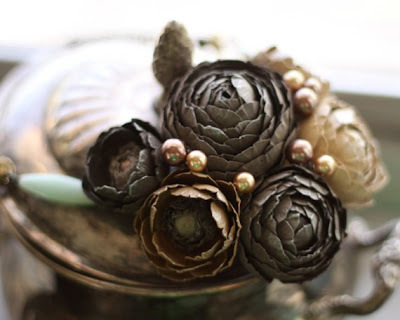 I love to keep an eye on wedding trends, especially current flower and color favorites, never knowing when the information will come in handy for the marriage certificates I quill. Recently I've been noticing that the ranunculus has become really popular in bridal bouquets. Latin for "little frog", it leads me to think of the fairy tale in which the toad turns into a prince after being kissed... and this makes it a fitting name for the flower because the perfectly round and full shape is truly regal. 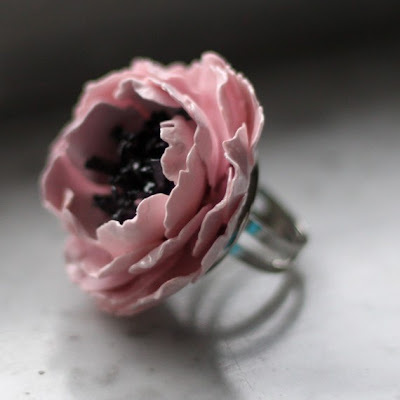 Brandy of Etsy shop, Blush Envy, creates paper ranunculus that look so much like the real thing, it's hard to believe they aren't fresh flowers. She sketches, cuts, and shapes the petals by hand from fabulous colored papers, and highlights each one with paint. 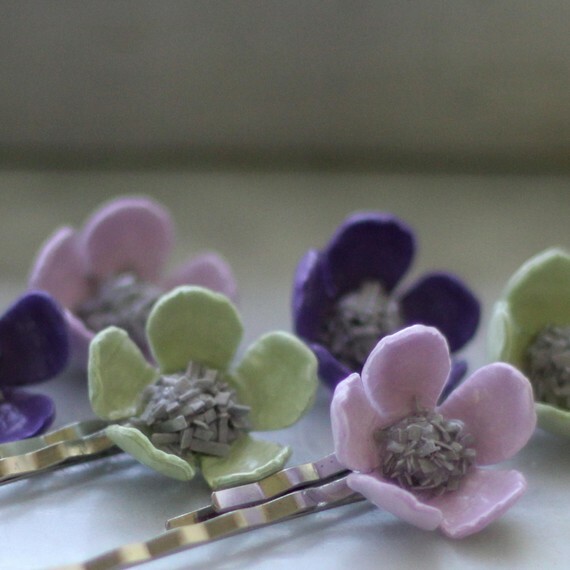 Finally, the whole piece is coated with a water-based sealer that protects the petals and makes them incredibly sturdy. Brandy explains that each flower goes through a minimum twenty step glazing process and takes at least a week to make. Once the romantic flowers are created, she constructs beautiful bib necklaces, rings, earrings, and hair clips, often adding elegant pearls and beads as accents. Blush Envy has only been open since May, but is already receiving a good bit of attention. 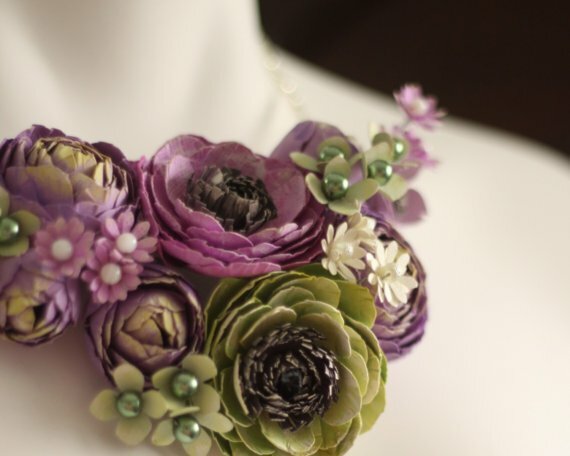 No surprise there, as the flowers and workmanship are truly gorgeous. And if you happen to be in Chicago in early December, Brandy will be traveling there from Florida to exhibit at the One of a Kind Show and Sale at The Merchandise Mart, December 2-5. If you go, just mention to her that you saw this post, and you'll receive 20% off your purchase. Blush Envy is on Facebook too. Gorgeous creations. I, too, love the ranunculus. The colors here in the designs are stunning. they couldn't look any better...even if they were real. This stuff is just stunning. Thank you so much for sharing it! Amazing! 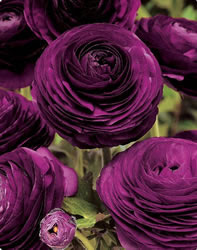 Ranunculus is one of my favorite flowers, too! I absolutely love the colors in that first necklace. Wow. It is hard to believe the flowers are not real. What brilliant colours! So beautiful. 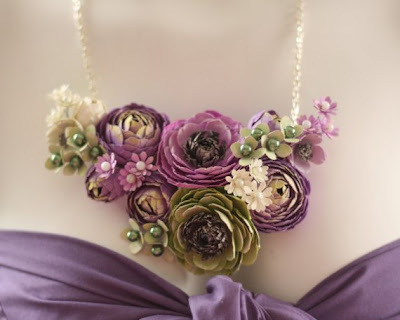 This jewellery takes your breath away. They are perfect. I would have thought that they were real. Interesting fact Orchids and other beautiful flowers grown in Thailand can be resin coated to keep the colors and looking real forever. 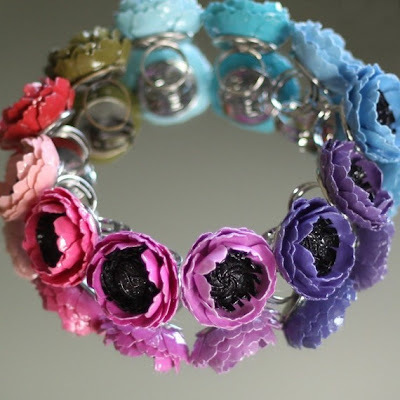 The flowers can be made into jewelry and other decorator items that you can enjoy and appreciate the natural beauty. Oh Ann! Thanks so much for sharing my work on your amazing blog! I was looking through your finds the other day and was blown away-I had no idea there was so much out there in paper! It is such a humble medium, and to see it transformed like Cinderella is such an exciting journey every single time. WOW - these are gorgeous! I just found your blog and became a follower! I love all things paper and I am excited to see what other people can do! I did a google search for quilling and your blog came up. I really want to try one of the quilled monograms featured in a previous post. I am so pleased to see that there is so much to do (and learn) in paper crafts! OMG! This is crazy beautiful!!! It would be nice to see her exhibit show. Really wonderful work of art. Awesome flowers. I wish I could do that. I made some more folded roses using your tutorial.Thanks times a million for sharing that with us.